The only request I can make right now is for time to slow down. Simply wanting more time to live in the moment of these precious days having my last newborn baby. I could cry thinking of how she will be one month in just a couple days and can hardly believe she is not kicking me in my bladder all night anymore! Where does the time go? There are so many daily chores to be done, how can I cherish my children as much as I possibly can. Well, during these early days of having a new baby around I always turn to large pasta bakes to help ease the stress of not having enough time. 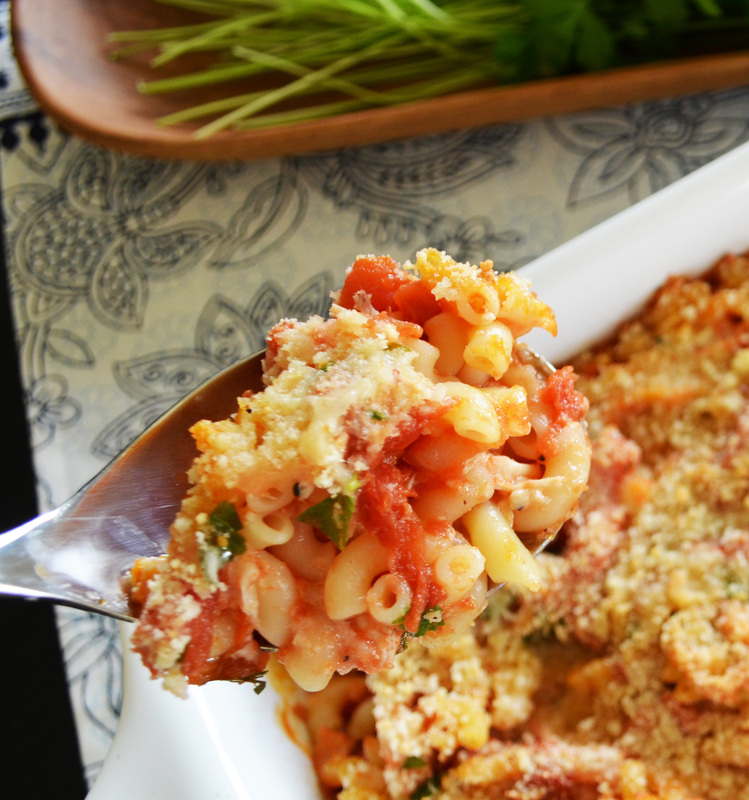 This baked chicken pasta dish is the perfect meal all in one pan and would be just delicious along side some homemade garlic breads. In my home this large bake usually lasts a couple of days, freeing up some time for extra snuggles and maybe an extra minute to stand in the shower not moving, staying way too long in water that’s scolding hot. All new moms know how taking a shower quickly becomes a mini vacation that feels way to good to be true when no one barges in with requests. Mini pasta in each bite with mozzarella cheese, tomatoes, chicken and a bit of fresh chopped parsley. Topped with a crunchy parmesan romano cheese and bread crumb mixture. Kids love it, husbands love it and I love it! If your are looking for a new bake to switch up your nightly meals and free up a bit of your next day this is a must try. I prefer to use a rotisserie chicken to make it fast and flavorful without effort, but you could also grill a couple chicken breast if you prefer. Check out these delicious baked dishes!! !